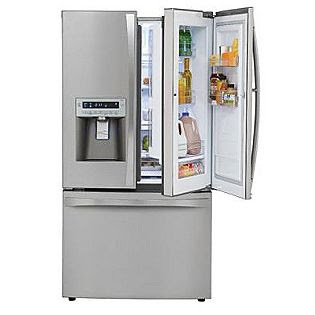 The appliance of the week is the Kenmore Elite 3-Door 31 cubic foot refrigerator, model 7205X. The Kenmore Elite 7205X is available in white (72052), black (72059), and stainless steel (72053). Consistent with the rest of the Kenmore Elite line-up, the metal handles have flared ends. Other common Kenmore Elite refrigerator features found in this model include LED interior lighting, contour doors, quiet operation, water and ice through the door, hidden hinges, air-tight crisper, and digital controls. And, yes, it's Energy Star-rated. Now, for what sets this refrigerator apart. The first, most obvious, feature is the capacity. 31 cubic feet (technically, 30.7 cubic feet). This is the largest refrigerator available that fits in the standard 36"W x 69"H space. With 20.7 cubic feet in the refrigerator compartment and 10 cubic feet in the freezer compartment, there is more than enough space to hold all the food for you and everyone at home. The capacity increases due to denser insulation, which allows for thinner walls, especially the ceiling, which has a recessed LED light array. The water filter is recessed in the ceiling inside the refrigerator compartment, so it doesn't protrude much into the valuable storage space. Also, the on-door icemaker has been slimmed from the 2010 design, which allows for enough space to store an entire 12-pack of soda on the icemaker door. The cold air vents for the icemaker are at the bottom of the left side of the refrigerator compartment to make room for the bank of LED lights on the side walls (left and right). Not only does light shine from above, but from the sides as well. This increases and improves the interior lighting so everything is properly illuminated. That cool blue-lit Kenmore Elite logo isn't just a pretty decoration inside the refrigerator. To ensure that refrigerator odors are eliminated, the 7205X has an internal air filter, which is located behind a Kenmore Elite logo on the back wall surrounded by a glowing blue border. Twist off the plastic plate and there's an activated carbon filter that keeps the air fresh. Nobody wants everything in the fridge to smell and taste like the onion you only used half of yesterday! This is also one of the first Kenmore Elite refrigerators to come equipped with KenmoreConnect, a feature first rolled out in Kenmore and Kenmore Elite laundry. It's a diagnostic system that allows a signal to be broadcast from the refrigerator through your phone to the 800 4 MY HOME call center. From there, the signal is decoded into a diagnosis, which allows the call center staff to either use troubleshooting or order appropriate parts to be delivered to your home. This saves a technician visit, and helps ensure an accurate diagnosis so it gets fixed right the first time. 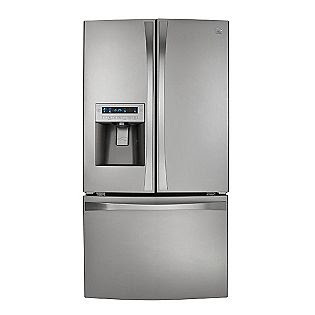 KenmoreConnect is also available on the 7109X model Kenmore 4-door refrigerator, with more on the way. The freezer drawer has the Kenmore Elite-exclusive Tilt-N-Take door, which tilts out the door for easy access to foods in the on-door basket, but also creates more room to maneuver if you're inserting or removing something large and/or heavy. The freezer also has THREE tiers! There's the main basket at the bottom, a shallow middle tier which is great for small or flat frozen goods like frozen vegetable so the face of each is visible, and the upper basket to store everything else. This freezer drawer is going to make organizing frozen foods easier than ever. The shelves are all spill-proof, and there are two slide-away shelves to let you add tall items to the fridge without having to rearrange everything in the process. The spill-proof borders prevent spills from spreading throughout the refrigerator compartment, so little messes don't become huge messes. They're all adjustable, for a great degree of flexibility. The right door has two adjustable gallon storage bins, along with a fixed covered dairy compartment at the top. 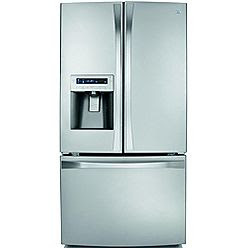 Features like the air-tight crisper, full-width pantry drawer, and the digital control panel on the door are common among many of the Kenmore Elite line, and these join with the greater capacity, KenmoreConnect, and enhanced LED interior lighting to give this refrigerator its status as the new pinnacle of the Kenmore Elite refrigeration series. For the greatest storage flexibility, capacity, convenience, and modern styling, the Kenmore Elite 31 cubic foot 7205X refrigerator is a terrific choice. Want all those features in a counter-depth model? Great! Check out the Kenmore Elite 7204X, available in white (72042), black (72049), and stainless steel (72043). All the same features can be found in this model, with a 25 cubic foot capacity - the largest of any counter-depth refrigerator! And, as if that's not cool enough, there's now the Kenmore Elite 7206X, available in stainless steel (72063). White and black will be available in March 2012. With all the features of the 7205X, the 7206X introduces the Grab-N-Go door for ultimate convenience! Get milk, butter, and condiments quickly and easily without opening the entire refrigerator to do it. Check out the Kenmore Elite 7206X!